(Nanowerk News) Scientists in South Korea used the Zinc Finger protein to develop a new manufacturing technique for size-controllable magnetic Nanoparticle Clusters. 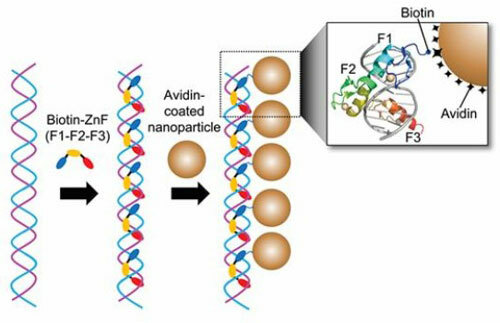 Professor Hak-Sung Kim of the Department of Biological Sciences at Korea Advanced Institute of Science and Technology (KAIST) and Yiseul Ryu, a doctoral candidate, used the Zinc Finger protein that specifically binds to target DNA sequence to develop a new manufacturing technique for size-controllable magnetic Nanoparticle Clusters (NPCs). Their research results were published in Angewandte Chemie International Edition ("Size-Controlled Construction of Magnetic Nanoparticle Clusters Using DNA-Binding Zinc Finger Protein"). NPCs are structures consisting of magnetic nanoparticles, gold nanoparticles, and quantum dots, each of which are smaller than 100 nm. NPCs have a distinctive property of collectivity not seen in single nanoparticles.